– WATER: Seems stupid, right? But seriously, Izzy loves water based products. I use more butters and oils for night moisture or scalp massages, but I’ve found that she acts the best when I’m finishing her off with something water based rather than butter/oil on wet hair (shea butter on my wet hair? naaaaw son!). – Aloe Vera: Aloe vera is absolutely my new all-star starting QB. I’d give it some groupie love if I could. I tried AV when I first big chopped, and really found it to be too watery/light on my hair. It was basically like finger combing water through it. I have no idea what changed, but I currently LOVE LOVE it. It’s fairly inexpensive and does an awesome job with “getting the white out,” softening a gel hold, and moisturizing my ends. Also, some of my fave prods are AV based, like AfroVeda’s PUR Whipped Gelly and Aubrey Organics Mandarin Magic. – Honey: Mmmm….honey. So sweet, and I love getting honey in my face while I rinse out honey/olive oil treatments, lol! It makes my hair feel so good after I rinse it out, like I’ve swirled it in clouds and silk (okay, random comparison). Honey is a humectant, and holds onto moisture (unless you are in a low dew point). I started using straight honey in my DC, but obviously can’t keep it in my hair b/c it’s STICKY, and love my products that contain honey – Oyin’s Honey Hemp Conditioner, Koils by Nature Nourishing Hair & Body Butter, NuNu Love Handmades Coconut Puddin’…I just think it’s great. I’m going to start adding honey and castor oil to my thinner cowashes. – Rosemary: Rosemary apparently stimulates the hair follicles and hair growth, reduce hair loss…yadda yadda yadda, blah blah blah use this herb and your hair will grow. I’m not going to spit any of that game at you. My love of rosemary is based solely on the fact that I love how it makes my scalp tingle. Does that mean my hair is being “stimulated”? I have NO idea, I just like it! It’s like Izzy is having her own little party and I’m the only one who got invited. And y’all know I love VIP! Well, there you go – some of my favorite ingredients for my hair. Now…what are yours? hey elle, new subscriber here 🙂 i really love your blog and have been catching up on all the informative vids and posts. one question regarding honey: are you using refined or raw? i’ve seen some other articles that specify the importance of raw honey and others that don’t. wanted to know what you’re using to get your results. thanks! I’ve used both, but I usually use refined. Raw is harder to work with. Thumping myself in the forehead for buying that hair industry conspiracy of washing your hair 1-2 times a month. I am LOVING the fact that I don’t run from rain, my children splashing in the tub and the pool. Just started following your blog and wondering about your hair. 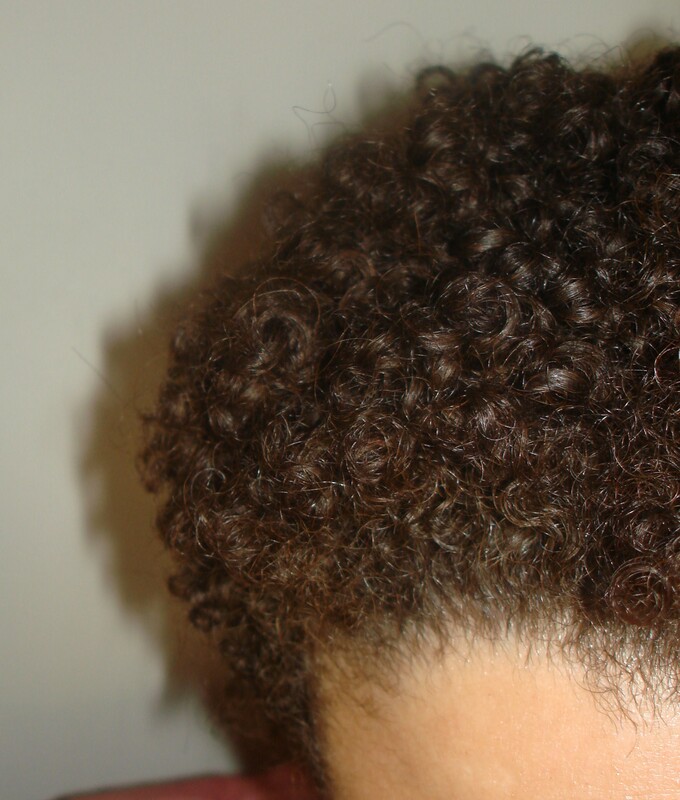 I think I have hair that is/will evolve to 3c but the curls are very defined but sooo tight. My hair is similar to yours when you BC. I also have very fine hair that drinks up product. Since I did the BC 2 weeks ago (5 month transition) you can see my scalp a whole lot more since the hair clumps so well – too well. Will the curl relax soon or do I just wait for it to thicken? BTW – I tried really tried Miss Jessie’s but it just wasn’t hittin on nothing. Hmmm…it really depends on your hair. You may be able to see your scalp since it’s fine – when I first bc’ed, I only had about an inch and a half of hair, but my hair is very dense, and med/coarse, so I never really saw my scalp. My curls haven’t changed much at all since I bc’ed (in December), and I think I’ll need some more length before my hair starts getting weighed down. If you want to thicken your hair, try doing scalp massages with Jamaican Black Castor Oil or regular Castor Oil; it will thicken naturally as it gets longer as well though. I’m with ya on the H2O and aloe! I love products that have both of these in them! Add another one of my favs: Behentrimonium Methosulfate, some panthenol, veggie glycerin and maybe some silk amino acids or another protein, a catchy name and a delicious smell and I’m probably gonna buy….